Adding cabbage to this recipe is a surprising twist. 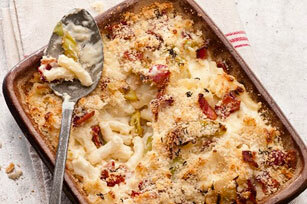 It adds a tender and sweet element to the savoury bacon and creamy noodles. You’ll be in heaven when you taste this mac 'n cheese recipe. Heat oil in a large skillet over medium heat. Add garlic and cook 1 min. Add cabbage and cook 3 min. until crisp-tender. Add cream cheese and broth; stir 2 min. or until cream cheese is melted. Add cooked pasta and bacon; toss to combine. Spoon into a 2-L baking dish. Mix bread crumbs and Parmesan in small bowl. Sprinkle over pasta mixture. Bake 25 min. or until lightly browned. Use 2 slices deli ham in place of bacon.